The USS Kentucky - a Trident ballistic missile submarine carrying a full complement of 192 nuclear warheads - sets out on a routine cruise. Not long after it reaches the open sea, however, the Kentucky receives a launch order. After receiving that launch order, it is cut off from all counter orders and disappears into the Pacific while it makes the eight-day transit to the launch site. What the Kentucky's crew doesn't know is that those launch orders didn't come from the US government. At the top of the world… at the bottom of the sea… a war has begun. Below the polar ice cap, an American nuclear submarine moves quietly in the frigid water, tailing a new Russian sub. But the usual, unspoken game of hide-and-seek between opposing captains ends when the Americans hear sounds of disaster and flooding, and the Russian sub sinks at a depth of a thousand feet. The American sub rushes to help, only to join its former quarry in the deep. The situation ignites tensions around the world. Excellent thriller. Can't wait for more! 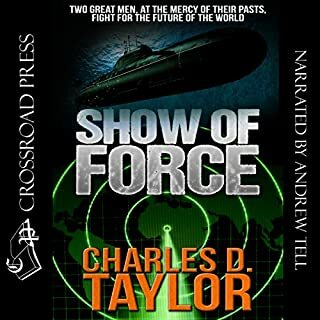 As the two largest, most powerfully equipped naval fleets in history move slowly toward each other near Islas Piedras - an American missile site in the Indian Ocean that threatens Russia's grip on the Middle East - two men stand in the darkened control rooms of their ships. David Charles and Alex Kupinsky are worried because, as the admirals of these fleets, they may be responsible for all-out nuclear war. They are also concerned because once, a long time ago, they were the best of friends. A confrontation of nuclear submarines just 200 miles off the American coast is the scenario of this riveting novel by a former U.S. Navy submarine officer. At the center of the deadly conflict are two men on a mission: one wants to find his father's killer, while the other wants to destroy Glasnost and provoke a war. The ensuing underwater chases and battles build to a stunning showdown. An enzyme that will dramatically prolong life has been discovered 2,000 feet down in the North Atlantic, in an area known as "Lost City". But why are the people attempting to harvest it getting killed? Why are the scientists in a remote Greek laboratory disappearing one by one? To Kurt Austin, leader of NUMA's Special Assignments Team, and his colleague Joe Zavala, it's clear they have their work cut out for them, but it may be even bigger than they think. Admiral Theodore Magnuson, director of the Office of Naval Intelligence, didn't like the idea of sending the Seventh Fleet to Vladivostok for a New Year's celebration with the Russians. The president didn't give a damn what Magnuson thought, however; he was after détente. Fearing the worst, Magnuson decides to run his own intelligence mission, sending men into Russia and China. The admiral is certain the US visit to the usually closed Soviet port is a cover for something. Something big. This set includes Crash Dive, What Comes Around, and White Death, three Alex Hawke novellas never available before on audio. In Crash Dive, Alex Hawke is on a highly covert mission to enter another nation’s airspace undetected and find a way to avert a global war. In What Comes Around, two CIA officers are found dead. Hawke discovers that the victims are connected through one man: Spider Payne, a rogue intelligence officer. In White Death, M16 suspects a bizarre conspiracy when two bankers are found dead, and vast sums are plundered from the Queen of England’s accounts. She was a monster, sleek and gleaming, designed to strike without warning like the dreaded shark. She was the USS Mako, as fearless and bold as any submarine that ever prowled the blue Pacific. Her mission: seek out and destroy the hitherto invincible ships of the Japanese Imperial Navy - and revenge the earlier defeats of a long and dirty war. Here is the story of the men who pitted their lives against impossible odds in the most dangerous branch of the American armed services. Before he was considered a CIA superagent, before he was thought of as a terrorist's worst nightmare, and before he was both loathed and admired by the politicians on Capitol Hill, Mitch Rapp was a gifted college athlete without a care in the world...and then tragedy struck. In the not-too-distant future, the United States loses its status as a world Superpower. With the military cut to a barebones level and American leaders focused solely on the nation's internal struggles, the door will open for new powers to emerge on the world stage. In the wake of this power vacuum, China and Russia begin to flex their military muscles and expand their dominance in the world. They have the most up-to-date technological innovations ready for battle: railguns, unmanned drone tank vehicles, exoskeleton suits, and cyber warfare. Navy pilot turned submarine officer Jerry Mitchell is now the navigator aboard USS Seawolf. On a reconnaissance mission deep in the Barents Sea, Mitchell and his crew prepare to watch the Russian navy as it trains for battle. Although they are outside Russia's territorial waters, the U.S. boat is ambushed by Russia's newest attack submarine, Severodvinsk. Its aggressive new captain, Aleksey Petrov, harasses the American intruder with dangerously fast, insanely close passes. The accident changed everything...One moment, Lieutenant Jake Slate was going about his duties aboard the ballistic missile submarine, USS Colorado. The next second, he was sprawled on the deck plates in a spreading puddle of blood and hydraulic fluid. But it wasn't the injury that ruined his life and doomed his military career. It was the rescue effort. Now he's being thrown to the wolves to cover up the misdeeds of a superior officer, and Jake doesn't care for the role of sacrificial lamb. Marsh Vincent, Mick McCarty, and Tommy Lewis were inseparable friends during their naval academy years, each man in love with the beautiful, unattainable Glory Hawthorne. Only Tommy wins her heart and marries Glory after graduation. Different skills set the three men on separate paths in the Navy, but they are all forever changed by the Pearl Harbor attack on December 7, 1941. Glory, now Tommy’s widow, is a tough Navy nurse still grieving her loss while trying to save lives at the Pearl Harbor naval hospital. When a NASA satellite discovers an astonishingly rare object buried deep in the Arctic ice, the floundering space agency proclaims a much-needed victory, a victory with profound implications for NASA policy and the impending presidential election. To verify the authenticity of the find, the White House calls upon the skills of intelligence analyst Rachel Sexton. Accompanied by a team of experts, including the charismatic scholar Michael Tolland, Rachel travels to the Arctic and uncovers the unthinkable. Juan de Santiago is not only a billionaire coca grower, he is also a deranged revolutionary; the commander of the most powerful private army in South America. Backed by power-hungry rogue nations who supply him with the latest weaponry, de Santiago devises a plan that will dishearten the American antidrug effort and make him El Jefe once and for all. October 1943: Lt. Commander Jack Tremain is back on duty with a new sub and a new mission. But when he spots the Shigure - the Japanese destroyer that sank his beloved first command, the Seatrout - he declares his own personal war on the dreaded ship known as the "Submarine Killer". Twenty years ago, the KGB planted an agent in the American Navy. Today, he is the commander of an American nuclear attack submarine! In a world of darkness, super-sensitive listening devices and nerve-wracking tension, Newell's crew is being driven to the breaking point: cut off from communications and forced to destroy "enemy" subs in a war they can't confirm. And while the US Pacific Command scrambles to find out who is attacking their fleet, two American submarines must go to war - against an aggressor who knows their every move, and is rapidly destroying America's sea-based strategic nuclear defense. 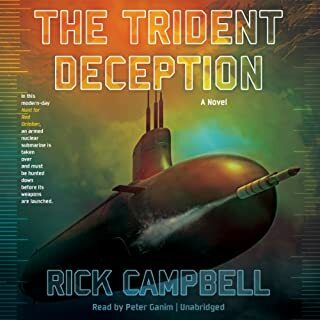 If you enjoy books about the military and the way it functions, specifically about the navy and it’s submarine service, then I think you will enjoy this. It’s long, and it gets technical, and there are a lot of details which, if carefully read will make the action on which this story hinges and the amazing climax of the book easily comprehensible and even more thrilling than it would be, otherwise. However, this book is far more textured. It’s not just a military story, or a sea story (much as I love sea stories). It is, at its heart, about people; what motivates them, how they react, especially under extreme pressure, and where, and how strongly, they place their loyalties. Part of what makes this book so satisfying is that the author inserts his readers into each wardroom …and by the time the crunch comes, this reader, at least felt less like an observer, but a member of each crew. I found myself wanting the best for almost each and every character, even though I knew some would have to die, and it helped that I “knew” some of the families, as well. I have read many books about ships and sailors, including submarines and submariners, but it was this book which brought home to me just how isolated, and how fragile, a submarine can be, and the courage it must take to submit oneself to an environment as hostile and dangerous as outer space. Not only do we see the aspects of submarine warfare played out, but we also get to see political strategies and diplomacy on a grand scale, primarily from the viewpoint of the USSR. Again, the author is wise enough to humanize the players, so these aren’t automatons playing roles but believable characters who must gather information and make decisions in record time that will profoundly affect the entire world. The writing is brisk, detailed, and yet sometimes thoughtful and even poetic. The author can handle human as well as technical details and interlace them in ways that make this book interesting for both military buffs and those who prefer to read about people and what drives them. The narration was excellent, as well, in all areas. I did notice, and I am not sure if this is a narrator issue or a technical issue, that when characters were speaking, the voice was louder than when they were thinking. Sometimes, when a character was becoming introspective, or when something was being described, the volume became so soft that it became distracting. However, this did not affect my thorough enjoyment of this excellent book. I give both book and narrator 5 out of 5 stars, as I expected to be able to do, having read another of this author’s books. I received a free copy of this book in exchange for this unbiased review via the courtesy of AudioBookBlast dot com. Yes. The book is unique, suspenseful, and thought provoking. What was one of the most memorable moments of Boomer? When Wayne Newell's EO figures out what is really happening. Have you listened to any of David Gilmore’s other performances before? How does this one compare? This is my first listen. When the Pasadena and Manchester met their fate. Viewed from the American perspective Wayne Newel is a traitor, however he is a Soviet sleeper agent, trained in boyhood in the Soviet charm school and then implanted in the USA taking the identity of a deceased only child orphan. A long term plan finally aligns up and comes to maturity. Wayne Newell is now the commander of an American attack sub. He has an American family right down to family dog. He is now in position to be awakened. The communication equipment on his sub is altered to receive messages from a soviet spy ship which appears to be messages from sub-com. 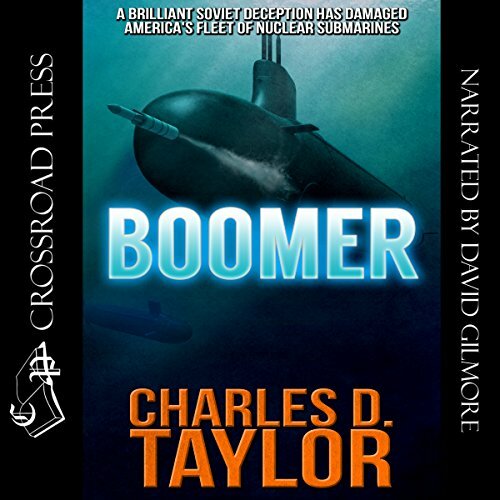 Wayne Newell convinces his crew that America is at war and that the Soviets have a masking device which imitates American boomer submarines, and he then begins to take out American boomers convincing his crew that they are taking out Soviet subs.. The Us navy sees something is amiss and sends out Ben Steel and his attack sub the Manchester to protect the Boomer sub Florida commanded by Buck Nelson. There are flash backs with the characters as well as reminiscences which can be confusing at times, but which also serves to let the listener/reader know the character's make up, values, past life and personality. Overall this is an excellent book which would make great movie. The theme is classic. The suspense is intense. And there is a heaping service of Biblical justice. Very good techno thriller from the 90s. fascinating and scary plot. the narration production was uneven, sometimes changing volumes and changing and quality. Gripping story and excellent performance. 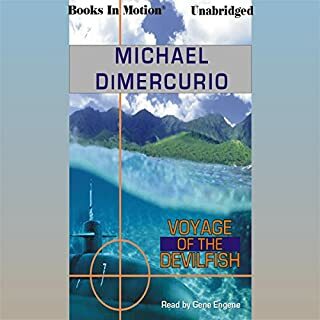 The riveting story with realistic descriptions of a submariner's living and working conditions, together with the skill of the narrator, made me feel as though I was on board with the crew. The author's revelation of the thought processes behing the strategy employed and vivid accounts of combat action kept me from being able to put the book down. In addition to exciting action, the plot illustrates how vulnerable the east-west "peace" was during the Cold War, and how easily the nuclear deterrent's MAD Doctrine could be subverted by the "madness" of political leaders who believed that a nuclear war could be "winnable" by the side that makes an unexpected first strike, and that the death and destruction visited upon its own population by a crippled opponent's retaliatory strike would be "acceptable losses" - and assumed that the other side felt the same way. It also illustrates how the naval command structure that gives absolute authority to the captain, and demands instantaneous unquestioning obedience from the crew of its submarines while on patrol, coupled with the absolute stealth and secrecy of the operations of the "silent service" is a two-edged sword that can produce disastrous results when either the loyalty, the sanity, or both, of the captain are compromised. What about David Gilmore’s performance did you like? 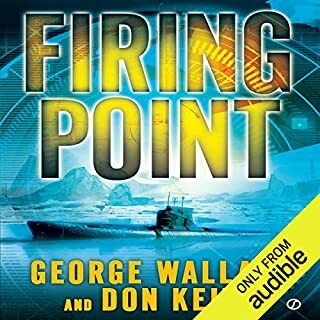 Opening with talk of one time codes and involving the Secretary of the Navy, Deputy Chief of Naval Operations (DCNO) and Rear Admiral of the Navy within the first 3 minutes, this book instantly grabbed my attention! It kept right on going after the gripping opener. The narration was poor at best. Hokey accents and mispronunciations throughout. Anyone having spent time aboard US Naval ship would have been similarly disturbed. Calls the 1MC the "eye" MC. Starboard in the navy I served with is pronounced "star-berd" not star BOARD. It chafed. Really distracted from the story. I hate to think the author either never l listened to the narration or, worse yet, knew no better. What did you love best about Boomer? Yes, this plot kept me wanting more! I listened to the entire unabridged book in less than two days. 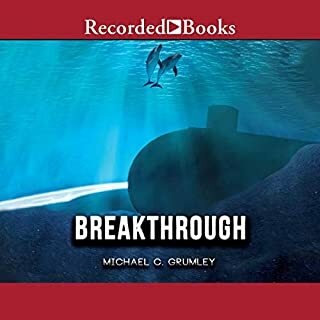 The book instantly took off and developed into an action packed novel with an expertly created and even more expertly placed captain aboard one of America's most elite class nuclear subs. Captain Wayne Newell was the ideallyc "Perfect American". He had a beautiful wife, two children a dog, house, education, and a career that made his nation grateful to him. Perfection isn't always as it seems and this story never has a dull moment as the mild mannered C.O. Newell ' s perfect world is shaken when his crew begins to wonder who the bad guys are. Is the perfection only skin deep or will this expertly molded, Russian trained, "Perfect American " be able to follow through with his protocol?Supposedly invincible, The Boomers on patrol were carrying almost half of the nuclear defense weapons of the United States. Apparently somebody at the Kremlin some 20 plus years earlier had predicted the same. They implanted the "Perfect American", a Russian Charm School created, perfect version of an All-American star. Rising fast in his post graduate studies and through the Naval ranks until Wayne Newell reached his role as C.O. of the USS Pasadena, a Boomer Class Naval Sub.It is here that he was "awakened" by the Kremlin and told to relay to his crew of 160 sailors that the Russians were able to mask the sounds of their nuclear submarines and make them replicate the sounds of US subs. He ensured his men it was the Russians, the enemy, and they must be sunk. David had a great use of character voices and his narrator voice. I felt true emotion and the voices of the characters which just added to my enjoyment of the book. ***I feel that Gilmore must have enjoyed recording this one! It just keeps going... as a reader I was stuck trying to ponder the true war. Was it on the surface where their families are? In each submarine among the crew? Underwater in the vast oceans of the earth? 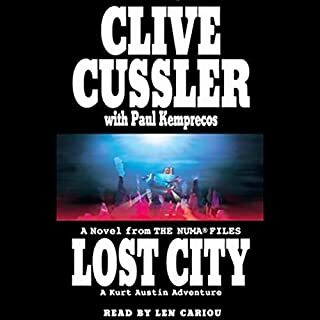 I love books by Larry Bond and Clive Cussler's Numa and Oregon Series. I am so relieved to find another author with audio books that I can enjoy! **I want to let you know that I was presented with a phenomenal opportunity; one that I could not pass up after reading this book's summary and other literary reviews of it online:This audiobook was provided for me to listen to by the author, narrator, or publisher at no cost in exchange for an unbiased review courtesy of AudiobookBlast dot com. I take this as a very important role, as I often base whether or not to try a new author on reviews by my fellow readers. I was thrilled to be asked to do the same. I promise to be 100% honest as I expect the same from other reviewers. Interesting story that didn't reach its potential. This is a decent book set in the waning days of the Cold War. The premise was very promising and the voice acting was quite good. Early on, the book had a lot of suspense Unfortunately it read like an abridged book with the author skipping plot points and the reader having to infer that the characters have learned something crucial when three chapters later they inexplicably know something that should still be a mystery. The book also felt rushed at the end as if the author hit his page limit. If you like submarine thrillers, this is a good choice. I read this between other, better, books and used it as a palette cleanser. I would give the story 3 1/2 stars.